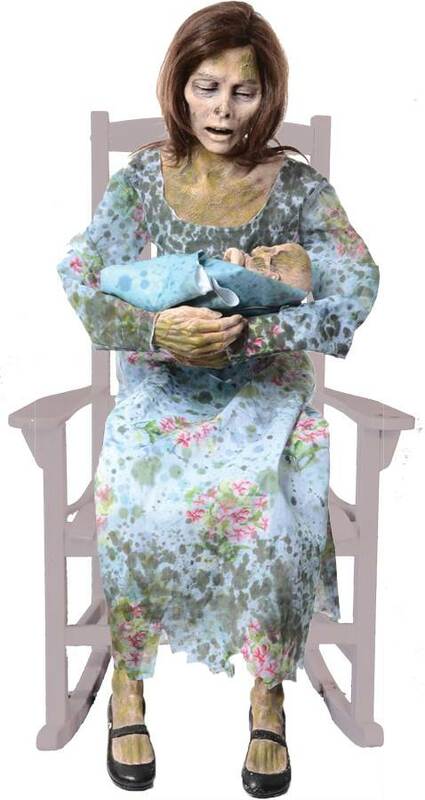 Moldy Mommy is a hauntingly creepy life-size character that portrays the tragic tale of a mother and child locked in their last embrace for all eternity. This forgotten family rocks back and forth in any chair and has horrifyingly realistic slush-PVC head and hands that look as though they are rotting and covered with mold and fungus, a fabric-wrapped slush-PVC baby, blow-molded plastic "moldy" feet, tattered "moldy" dress and shawl, and an easy-to-assemble metal frame. Plug in the UL power adapter into any standard outlet. Choose from Steady-On for both rocking and sound, Steady-On rocking with foot pad-activated sounds, or OFF with Foot Pad activation for both movement and sound. Once activated Moldy Mommy will begin rocking her baby back and forth while saying three haunting sayings. Item includes volume control. Assembly required. Great item! Eerie watching her rock that baby and was easy to assemble. Will work perfectly on the rocking chair I have in my haunted house with man zombie babies around.